Tamiya Model Magazine International is the leading magazine covering all scale-modelling topics including armour, aircraft, cars, bikes, ships, science-fiction, dioramas and more. We have international authors and many different styles of model making and finishing, so there’s something for everyone. Model Military International covers the whole range of military scale-modelling topics including armour, vehicles, dioramas, figures, techniques, new kits and more, in all scales. We have international authors and many different styles of model making and finishing, so there’s something for everyone. Military Illustrated Modeller sets a new standard for quality model publications for serious modellers. With the finest models and modellers it's a must have for any enthusiast. Military Illustrated Modeller becomes is the vital resource and reference publication that all modellers will want to collect. Model Airplane International features the very latest news, reviews of the latest kit, accessory and book releases and the very best in modelling features and how to articles. Our standards of model finish, photography and insider information will mean you’ll find out the latest information here first. Radio Control Car Racer is the worlds leading monthly magazine for RC car enthusiasts. From up to the minute international race news and results, model reviews, how to guides, featured builds and news on all the latest new gear too. RC Racer is brought to you by the leading experts in the field. Don't miss out... Subscribe to RC Racer today! Slot Magazine is a all new bi-monthly (6 times a year) magazine for all slot racing and driving enthusiasts. Covering all aspects of the slot hobby from buying your first set to use at home right through to racing at International level! Every issue will contain the latest information on new products and releases, how toos, race news and the history of slot racing. Aeromodeller is the World’s only dedicated magazine covering Free Flight, Control Line, Indoor Flying and RC for the traditional aircraft building modeller. Established way back in 1935 and it's still the leading publication among enthusiasts! Every issue features building articles, features on plans, meeting reports, club information and the latest news and products for modellers. RC Model Flyer is the World’s leading publication for Radio Control Aircraft enthusiasts. 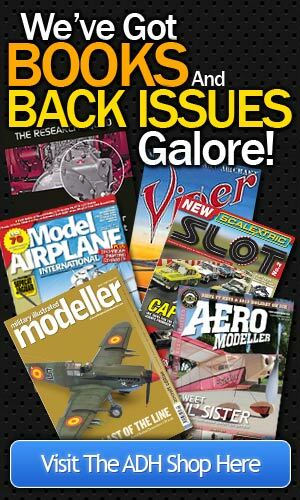 Every issue features building articles, free plans, club information and the latest news and products for RC Aircraft modellers. Subscribe Today To Get The New-Look Issue Delivered Direct To Your Door! RotorWorld is the leading RC Helicopter magazine for all RC Heli enthusiasts. Packed with up to the minute product news, gear reviews, projects, how to guides and much more. RotorWorld is brought to you by the leading experts in the field so don't miss out... Subscribe to RotorWorld today!